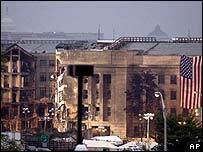 A US jury has been shown graphic images of people who burned to death in the 11 September 2001 attack on the Pentagon. 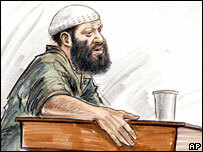 The jurors will decide whether al-Qaeda plotter Zacarias Moussaoui should be executed or jailed for life. After the pictures were shown, the self-confessed plotter shouted: "Burn all Pentagon next time." On Wednesday, jurors will hear a cockpit recording from the jet that crashed in Pennsylvania as passengers tried to overpower the hijackers. Prosecutors hope such emotional evidence will persuade the jury to opt for the death penalty. However US district judge Leonie Brinkema has warned prosecutors not to overdo it, reminding them that appeal judges could overturn a death sentence if they believed it was overly prejudicial. She has ruled that a recording - from the flight deck of Flight 93, which crashed in a field in Pennsylvania - cannot be released publicly, following objections by relatives of those on board. As a series of pictures of charred bodies was displayed on a screen in the Washington courtroom on Tuesday, there were gasps from those watching. Defence lawyers objected to the evidence but were overruled. Some pictures showed body parts; one a burned corpse on a plastic sheet; another a torso coated in white ash. They also heard a recording made by air traffic control in which a voice from the cockpit of a hijacked jet can be heard screaming: "Mayday, Mayday, get out of here." Pentagon workers related the scenes of horror and panic inside the building after it was blown up by a hijacked jet. "It seemed to me that it was just a curtain of fire," said US Army Lieutenant-Colonel John Thurman. Lieutenant Nancy McKeown, 42, said: "Every time I took a breath, my insides felt like they were on fire." The jury also heard from the widow of a man whose telephone call from one of the twin towers of New York's World Trade Center was heard on Monday - including his final words as it collapsed. Wendy Cosgrove said her husband Kevin's death had affected their children deeply, with one since becoming angry and self-destructive and another turning to self-mutilation. Moussaoui, a French citizen of Moroccan descent, is the only person charged in the US in connection with the attacks. He has been seen smiling during some of the evidence. At the end of proceedings on Monday, he shouted: "God curse you all, God bless Osama" - a reference to al-Qaeda leader Osama Bin Laden. The jury deciding his fate has already declared him eligible for the death penalty. Although he was in jail in Minnesota at the time of the attacks, jurors ruled that lies told by Moussaoui to federal agents kept them from identifying and stopping some of the hijackers. Defence lawyers say the jury should spare Moussaoui's life because of his limited role in the attacks, evidence of mental illness, and because his execution would only fulfil his dream of martyrdom. They are also seeking to get "shoe bomber" Richard Reid to give evidence, a move opposed by the prosecution. Tuesday saw the judge issue an order requiring an unidentified individual to be produced for testimony. Moussaoui has testified that he and Reid, who is serving a life sentence after a failed attempt to blow up a transatlantic flight in 2001, were to have hijacked a fifth plane on 11 September and flown it into the White House. The defence says Moussaoui is exaggerating his role, and believe Reid could undermine his version of events.